Yeah for a birthday at home! Today is Annabelle’s ELEVENTH month birthday… and I’m so happy to announce that except for our clinic visit… she is spending her very first one-month-birthday HOME!!!! Last week, I was worried. On her 10-month-birthday, I’d made a big deal about it being her LAST 1monthbirthday in the hospital, as we were set to go home 4 days later. When we got back in the hospital the first time, I figured… plenty of time to get home! But after the second time, especially when we found out she was going to have another open-heart-surgery… I succummed to the fact that we would be spending ALL of her one-month birthdays in the hospital. But WOOHOO… it was not meant to be! We are HOME HOME HOME! Just in time too… as Scott got to spend Father’s Day with his Annabelle HOME! Unfortunately… Karalynn, Lacy, and Gabby are still in NC… but at least ONE daughter was home! I love being home. It is exhausting. Overwhelming. Emotional. But so totally worth it. 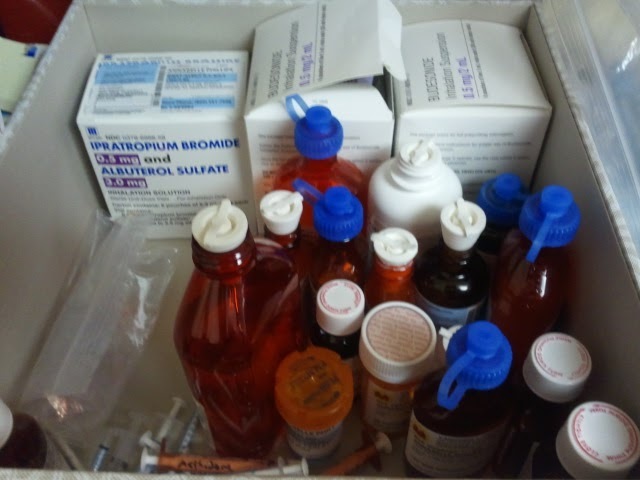 We are on even more meds than we were when we were home before. Including breathing treatments, a total of TWENTY. 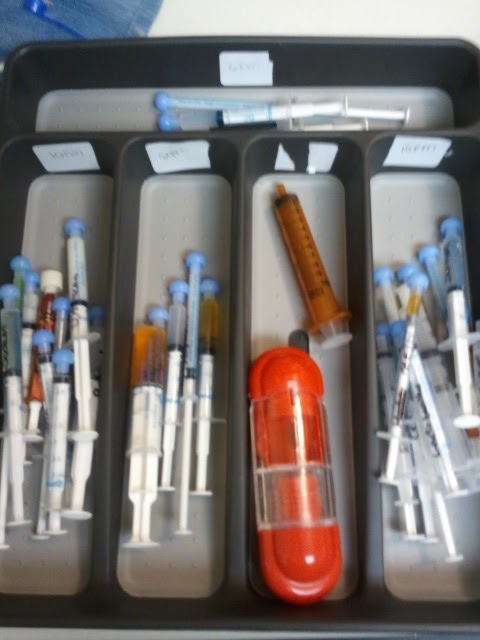 Med pic…. this is actually missing three of them too! We had another clinic visit today. It went GREAT. Her ECHO looked great, her EKG looked great, and she looked great. I checked her labs online that they took, and for the most part, they looked great too! Praying that they continue that way, as we are on some meds that I’d REALLY like to get off soon, which will help us in the “med prepare” exercise. 20 is… a lot! Everyone we can get rid of would be a HUGE blessing! Annabelle visited her friend, Anna Reese, in the hospital today. SO sad to see her there again, please keep her in your prayers as well! Annabelle is doing some funny things lately! She is ALMOST rolling over! It sounds SO weird to say that about my 11-month-old! But it’ll be a big step once she does it! She’s also having fun playing with her mouth! She LOVES to smile when she is feeling good, and is starting to play with her tongue! You’ll see her with her mouth open, her tongue licking her lips or swirling in her mouth. It’s too cute! Right now… she’s playing on the floor with her toys. So… normal. I look around my house and see a billion things I need to do. We went to the hospital so fast… I need to CLEAN my house back up, and organize and put away all the stuff we’d taken to the hospital. It’s just very chaotic! Scott and I have been slightly spoiled in having my mother-in-law with us to help with the day-to-day household stuff this past year, so we just need to get into a rhythm again. Right now, I’m enjoying having five minutes just to sit. A rare thing!!! That Annabelle’s heart continues to grow stronger. That her LUNGS grow stronger so we can get her off oxygen! That we can get plugged in with Physical Therapy now that we are home and get her whole body stronger. For us to get into a good routine at home that works for our family. 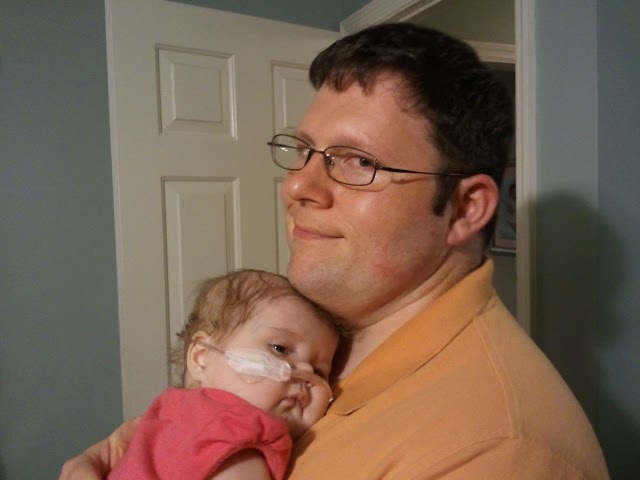 Finances… with Annabelle in and out of the hospital, haven’t had a lot of time to focus on that. We are still praying God provides Scott with the perfect job for him that meets our needs, both financially and health insurance-wise. Kara,Lacy,Gabby… everytime we speak with them, we can tell they are getting a little more homesick. I miss them all SO SO SO SO badly, and can’t wait to see them in a week! Please pray that they can have fun this last week, and that God gives them STRENGTH and peace this week. It breaks my Mommy heart to hear them cry to come home! They love their gma and gpa’s house, but they haven’t had a “normal” family life at home in almost a year… it is TIME! 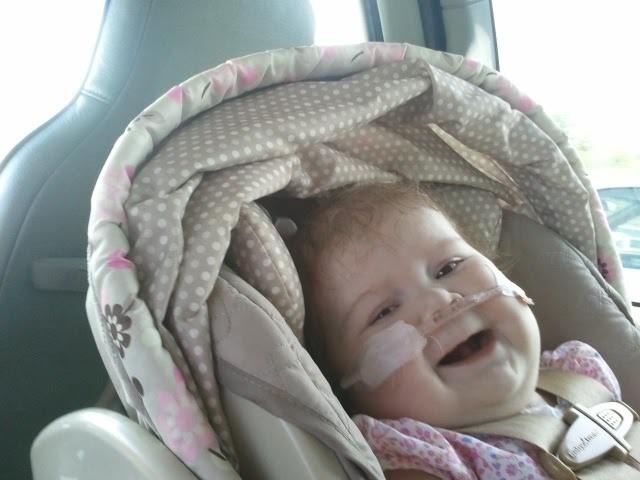 Annabelle… on her way to clinic today!!! I think she was excited to see Dr. Dodd, Dr. Albers, and Miss Judy… but ALSO was excited to know that she was gonna come right back home! Happy birthday Annabelle! We will be lifting up the prayer requests you have made. Happy 11 month Birthday, Annabelle (an Happy 1st One Month Birthday at home)! You look so happy in your pics. We're praying for you. We'll pray for all the things on your Mommy's list. So glad for continued good news. So thankful to our wonderful Father. He is good, whatever He brings. But grateful for answered prayer. I just adore that smile! !